JURNAL CITA HUKUM: Indonesian Law Journal is an international journal peer-reviewed journal on Indonesian Legal Studies published biannual since 2013 by Faculty of Sharia and Law Universitas Islam Negeri Syarif Hidayatullah Jakarta in cooperation with Center for the Study of Constitution and National Legislation (POSKO-LEGNAS). Registered P-ISSN at LIPI in 2014 and E-ISSN in 2016. JURNAL CITA HUKUM: Indonesian Law Journal aims primarily to facilitate scholarly and professional discussions over current developments on legal issues in Indonesia as well as to publish innovative legal researches concerning Indonesian laws. The Review, hence, welcomes contributions from international legal scholars and professionals as well as from representatives of courts, executive authorities, and agencies of development cooperation. The Review basically contains any topics concerning Indonesian laws and legal system. Novelty and recency of issues, however, is a priority in publishing. 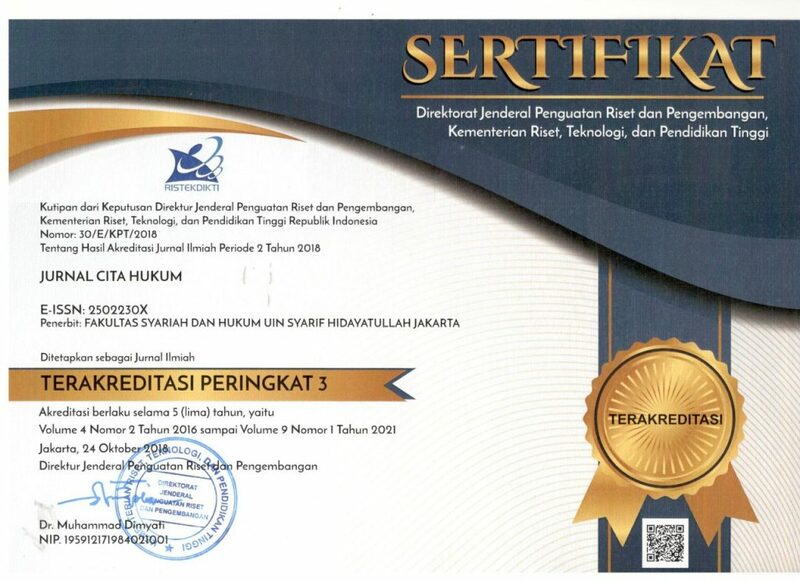 JURNAL CITA HUKUM: Indonesian Law Journal Nationally Accredited based on the Regulation of the Minister of Research, Technology and Higher Education, Number 30/E/KPT/2018 and Indexed by Sinta 3 and has become a CrossRef Member since 2015. Therefore, all articles published by JURNAL CITA HUKUM will have unique DOI number.